CAPE CANAVERAL, Fla. (AP) — A communication drop-out has delayed a Christmas delivery at the International Space Station. 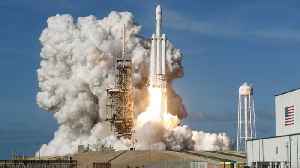 A SpaceX capsule full of holiday goodies got to within 32 feet (10 meters) of..
▶ Videos for "Spacex Christmas"
Business Insider reports Elon Musk had a special gift to share with fans of SpaceX this Christmas. Musk revealed that construction of a prototype for a Mars spaceship, 'Starship,' is now..